Colour blindness is the inability to perceive differences between some or all colors that other people can distinguish. About 10% of males have a color perception defect, but color blindness is rare in females. If you suspect that you are color deficient, take this simple but interesting color blindness test. Look at the image on the right. What numbers do you see revealed in the patterns of dots here ? The individual with normal color vision will see a 5 revealed in the dot pattern. An individual with Red/Green (the most common) color blindness will see a 2 revealed in the dots. NewMan Color Blind is a free online tool that allows you to see how your website colors look to color blind people. 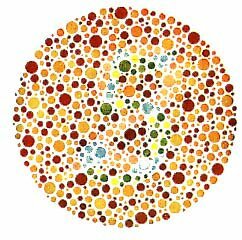 Use the Colour Blindness Simulator to analyze how your website images may appear to users with a variety of colour blindness conditions. Upload a JPEG image, choose the color blindness condition and see how colour blind users may see it. The Colorblind Web Page Filter is another service that allows you to see colors as they might appear to color-blind users. Google Groups: Have you looked at these messages? Google Software Bundle - Microsoft worried ?